Hearing that, Sister Deng said with a smile, “Sister, let us read two verses first. The Lord Jesus said: ‘I have yet many things to say to you, but you cannot bear them now. However, when he, the Spirit of truth, is come, he will guide you into all truth: for he shall not speak of himself; but whatever he shall hear, that shall he speak: and he will show you things to come’ (John 16:12-13). ‘For the time is come that judgment must begin at the house of God’ (1 Peter 4:17). From these two verses, we can see that in the last days, God will come again to express the truth and do the work of judgment. The Lord Jesus only did the redemptive work, that is, redeeming man from sin through the salvation of His crucifixion so that man was qualified to come before God. Meanwhile, through His teachings, He enabled man to gain a little superficial knowledge of himself, but that didn’t involve the change of man’s life disposition. So, if man wants to be cleansed, he must accept the work of judgment and purification by the word of Almighty God—Christ of the last days.” Having said that, she took out from her bag a book entitled Judgment Begins With the House of God. “Let us see what Almighty God says about it,” she said. Then she began to read: “The sins of man could be forgiven through the sin offering, but man has been unable to resolve the issue of just how he can no longer sin and how his sinful nature can be cast away completely and be transformed. The sins of man were forgiven because of the work of God’s crucifixion, but man continued to live in the old, corrupt satanic disposition. As such, man must be completely saved from the corrupt satanic disposition so that the sinful nature of man is completely cast away and never again develops, thus allowing the disposition of man to be changed. This requires man to understand the path of growth in life, the way of life, and the way to change his disposition. It also needs man to act in accordance with this path so that the disposition of man can gradually be changed and he can live under the shining of the light, and that he can do all things in accord with the will of God, cast away the corrupt satanic disposition, and break free from Satan’s influence of darkness, thereby emerging fully from sin. Only then will man receive complete salvation. … Therefore, after that stage was complete, there is still the work of judgment and chastisement. This stage makes man pure through the word so as to give man a path to follow. … This stage is more meaningful than the previous one and more fruitful as well, for now it is the word that directly supplies life for man and enables the disposition of man to be completely renewed; it is a stage of work more thorough. Therefore, the incarnation in the last days has completed the significance of God’s incarnation and completely finished God’s management plan for the salvation of man” (“The Mystery of the Incarnation (4)” in The Word Appears in the Flesh). 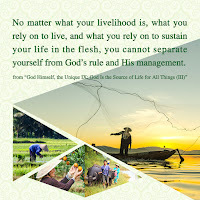 After reading these words, Sister Deng fellowshiped, “Almighty God tells us plainly that the Lord Jesus only did the redemptive work in the Age of Grace but didn’t do the work of eradicating the root of man’s sin. The effect that stage of work has achieved on man is nothing but enabling man to receive Jesus’ salvation and confess his sin and repent. But because the root of sin is still within man, unremoved, man can continually sin. For example, when people interact together, they can intrigue against each other, struggle for fame and gain, and have jealous disputes with each other; some can pursue evil worldly trends, living in sins; some can blame God and betray God when encountering tribulations and trials; sometimes people can pass judgment on God and disobey God once God’s work is not in line with their notions; and so on. Since we still have so much corruption, how can we enter into the kingdom of God? The Lord Jesus once said, ‘Truly, truly, I say to you, Whoever commits sin is the servant of sin. And the servant stays not in the house for ever: but the Son stays ever’ (John 8:34-35). As God is holy, He won’t permit those who are impure to enter into His kingdom; this is a heavenly law, and no one can break it. This shows us that it is not enough for people to only accept the redemptive work of the Lord Jesus and be forgiven of their sins. They have to accept the work of Almighty God in the last days—the work of judgment and purification by the word, because only those who have been judged and purified personally by Almighty God are qualified to be taken into God’s kingdom.” Then Sister Deng read me another two passages of Almighty God’s word concerning God’s work of judgment in the last days and fellowshiped much with me about them. When Sister Deng left, she gave me the book Judgment Begins With the House of God, and I was thrilled to bits with it. 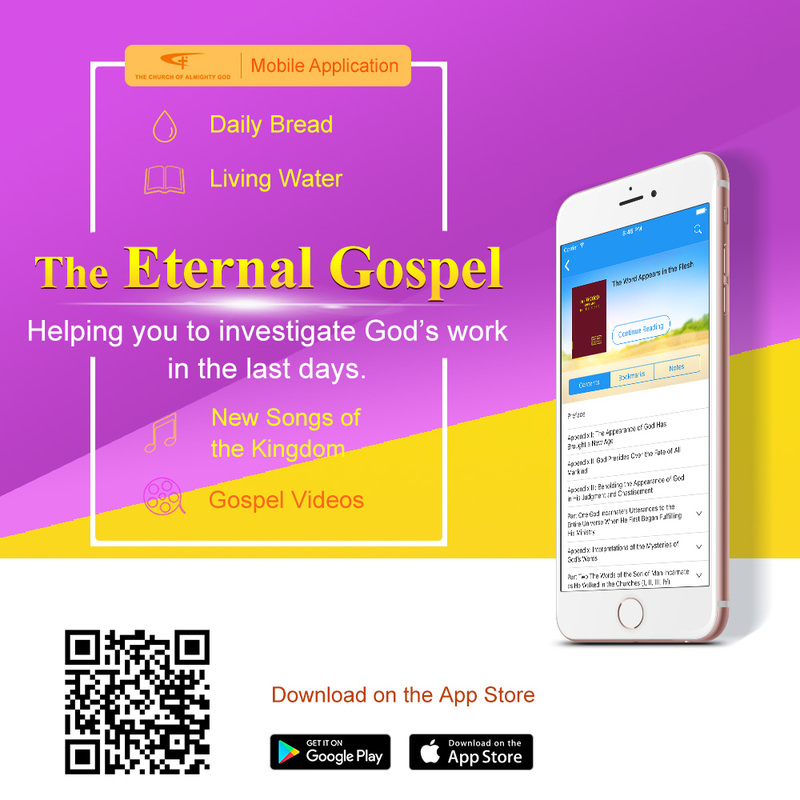 During the following few days, I read many pieces of Almighty God’s word: “The Mystery of the Incarnation (4),” “Christ Does the Work of Judgment With the Truth,” “The Age of Kingdom Is the Age of Word,” “How Does the Second Step of the Conquering Work Achieve the Results,” “Concerning Appellations and Identity,” and so on. God’s words resolved my notions completely, and I was fully convinced that the words expressed by Almighty God are exactly the way of God’s judgment in the last days. The more I read them, the more I felt I was too foolish and absurd. I came to realize that facing God’s work of the last days, what I had displayed was all the ugliness of arrogance and conceit. Had it not been for God’s mercy on me, I would not have heard His words of judgment. I confessed to God time and again. And I recalled how God had paid price for me and how I had resisted His work: In order to bring me before Him, God sent the brothers and sisters to preach the gospel to me time and again. But the stubborn and rebellious I, living in my notions and imaginations, rejected God’s work of the last days. Especially when I saw the book Judgment Begins With the House of God, I didn’t even allow the sister to speak anything about God’s new work, asserting that I had received the judgment and didn’t need God to come again to do any work of judgment and purification. Then I thought of Pastor Zhang, who had got sore boils all over and died tragically, and Sister Cui, who was in the terminal stage of cancer. And I suddenly realized why they had had such tragic outcomes: When God’s salvation of the last days came upon him, Pastor Zhang not only refused to investigate it but sealed off the church, threatening those believers who wanted to investigate the true way and preventing them from returning to Almighty God; when the brothers and sisters of the Church of Almighty God preached Almighty God’s work of the last days to Sister Cui, instead of seeking, she wantonly slandered it and even told her husband and son to drive them off. Their suffering such disasters has revealed God’s righteousness. At that time, I remembered this verse in Revelation: “And I heard another voice from heaven, saying, Come out of her, my people, that you be not partakers of her sins, and that you receive not of her plagues” (Revelation 18:4). I felt God was calling me to immediately turn back from the path of resistance to God and keep pace with God’s new work and accept His work of judging and purifying man, so that I wouldn’t end up being punished for resisting God. God’s love for me was inexpressibly great! At that moment, I was extremely remorseful, tears streaming down my face. I hated myself: I am too blind to know God, and have always been stubborn and opinionated and living in my own notions and imaginations, so that I rejected the brothers and sisters who preached the gospel to me. Also, I have hindered many brothers and sisters from investigating God’s salvation of the last days. I should have been punished by God according to my rebellious deeds. When I thought of that, my heart wrenched, and I prostrated myself before Almighty God and prayed, “O Almighty God, I am too ignorant and have truly wounded Your heart. I hate myself for being too foolish to see Your deeds and thus having resisted You. But You didn’t forsake me and still gave me an opportunity to return to Your family. I don’t know what I can do to repay You; I only hope to go all out to bring those true believers in the Lord before You to receive Your salvation, so as to make up for my transgressions.” The next day, with the book of Almighty God’s word—Judgment Begins With the House of God, I went to the homes of those true believers in the Lord in my former church to preach the gospel to them, sincerely repenting to God and repaying His love through practical actions.